Nothing says summer for watch enthusiasts like bright and colorful dive watches. And the vibrant orange OMEGA Seamaster Planet Ocean Chronograph absolutely fits the bill. So, join us as we check out this super cool OMEGA diver’s watch that we are completely crushing on. The OMEGA Seamaster Planet Ocean is a watch that is will look great on any wrist. In 2005, OMEGA debuted the Planet Ocean collection to continue the dive watch heritage of the Seamaster collection. Furthermore, the name of the collection emphasizes OMEGA’s commitment to the marine conservation work the company supports. Marine exploration and appreciation is the name of the game with OMEGA’s Planet Ocean line. Large, bold, and technically proficient, the Planet Ocean 600M is OMEGA’s ultra modern diver’s watch. As its name suggests, each OMEGA model in the collection boasts a water resistance of 600 meters or 2,000 feet. Identical to all contemporary dive watches, it comes equipped with a unidirectional rotating bezel to track immersion times. Furthermore, as expected, the lume on an OMEGA Planet Ocean is fantastic thanks to the SuperLumiNova accents for optimal legibility underwater. The OMEGA Seamaster Planet Ocean is the modern dive watch. As with other OMEGA collections, the Planet Ocean line is varied. For instance, there are larger watches for men and smaller ones for women. Additionally, there’s a range of materials including robust steel, luxurious gold, and ultralight titanium. Finally, in addition to the dive capabilities, there are also Planet Ocean models with additional functions such as chronograph and GMT. Take for example, this particular Seamaster Planet Ocean 600M Chronograph. Aesthetically, this orange Planet Ocean 2218.50.00 is fantastic. 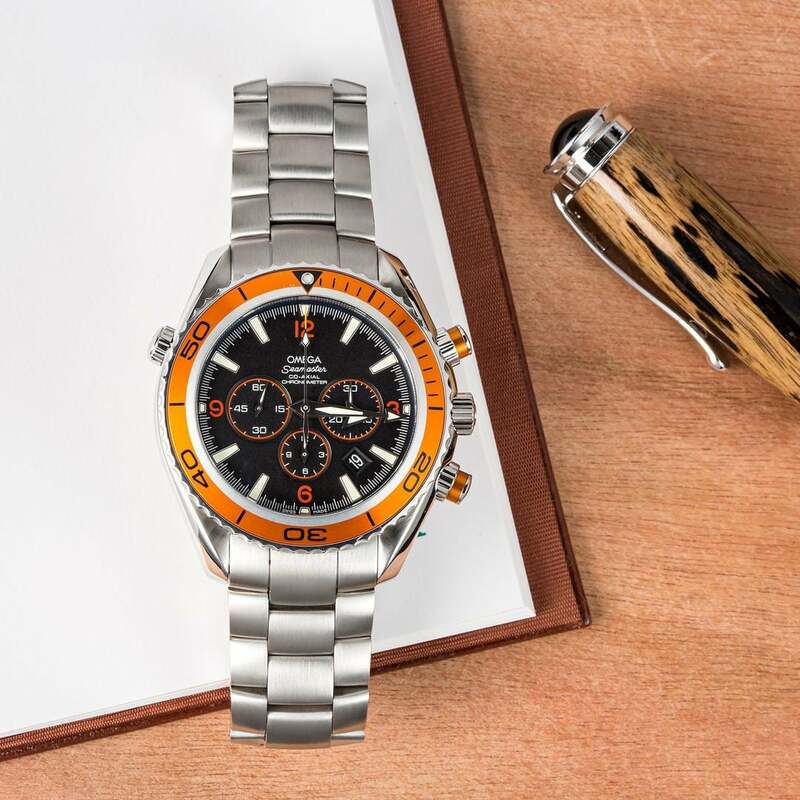 From its 45.5mm stainless steel case to its black dial to its orange bezel and accents, it really is an ideal summer watch. This being a chronograph, the case features the two chrono pushers at 2 and 4 o’clock flanking the winding crown. Plus, there’s also the helium escape valve at 10 o’clock to allow for proper decompression of the watch to prevent pressure damage. Further complementing the sporty shape of the case is the steel bracelet with the flat and wide three-link configuration. This sporty watch has a great design on both the bracelet and the clasp too. Housed within the case is the black dial accented with vibrant orange touches. Firstly, there are the orange 3, 6, 9, and 12 numerals, followed by the orange trio of registers. Additionally, even the screw-down chronograph buttons are given a touch of orange. Also on the dial is the date window positioned between 4 and 5 o’clock. However, the coolest thing on the dial are the broad arrow style hands that is so characteristic of OMEGA. Protecting the face of the watch is, of course, sapphire crystal with anti-glare treatment. Driving the OMEGA Planet Ocean 2218.50.00 is the Co-Axial Caliber 3313 automatic chronograph movement. It features the famous Co-Axial escapement and it offers the time, date, and chronograph functions. With 25 jewels and operating at 28,800 beats per hour, the Caliber 3313 offers a 55-hour power reserve. Protecting the self-winding chronograph movement is the solid caseback with the iconic seahorse logo typical of OMEGA Seamaster models. 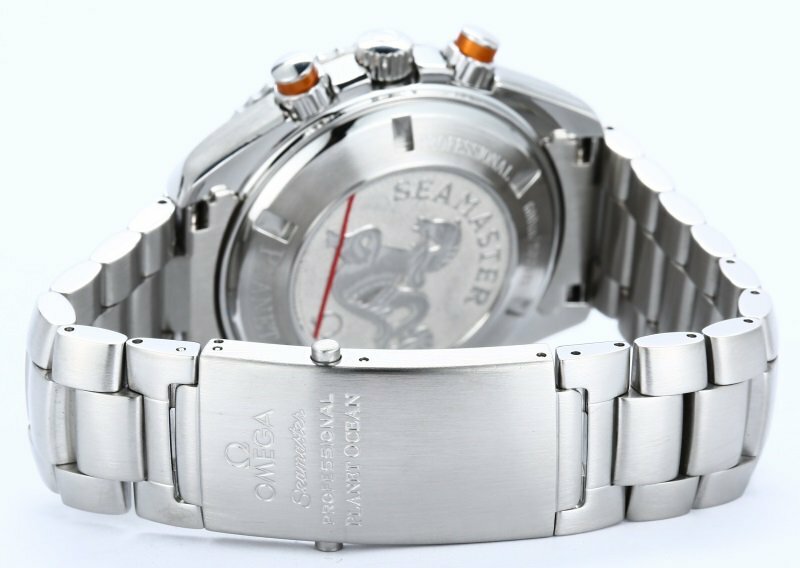 Fun fact: OMEGA has used the seahorse emblem on their Seamaster models since 1958 to symbolize the watch’s water resistance. 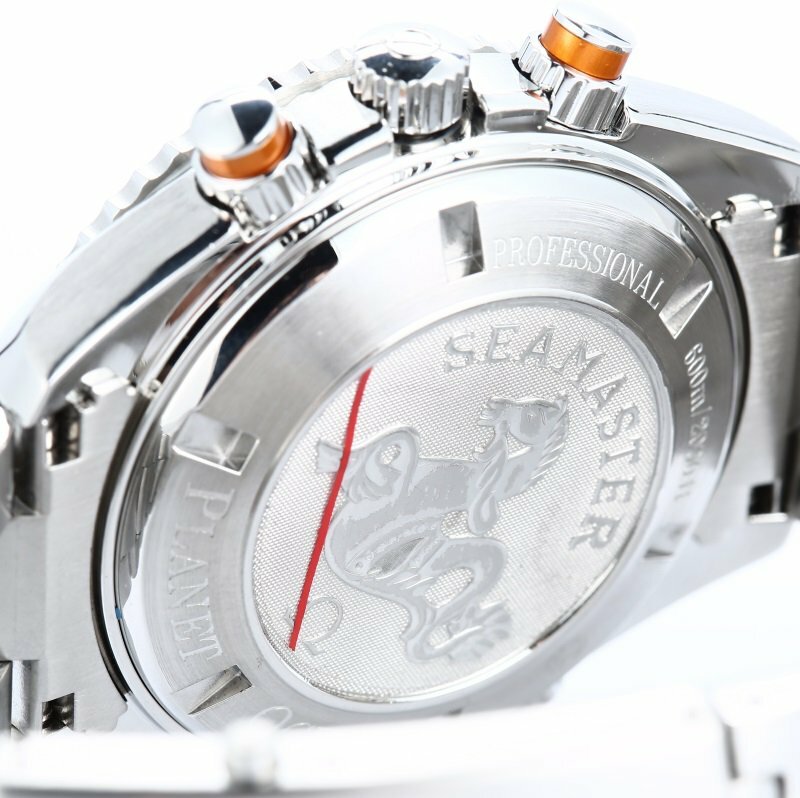 There is a seahorse design on the caseback of OMEGA’s Seamaster models. Built to dive yet perfectly appropriate to wear everyday on dry land too, the orange Planet Ocean Chronograph is one of OMEGA’s best looking modern Seamaster models. And during the hot summer months, there’s nothing wrong with a little added brightness on the wrist! 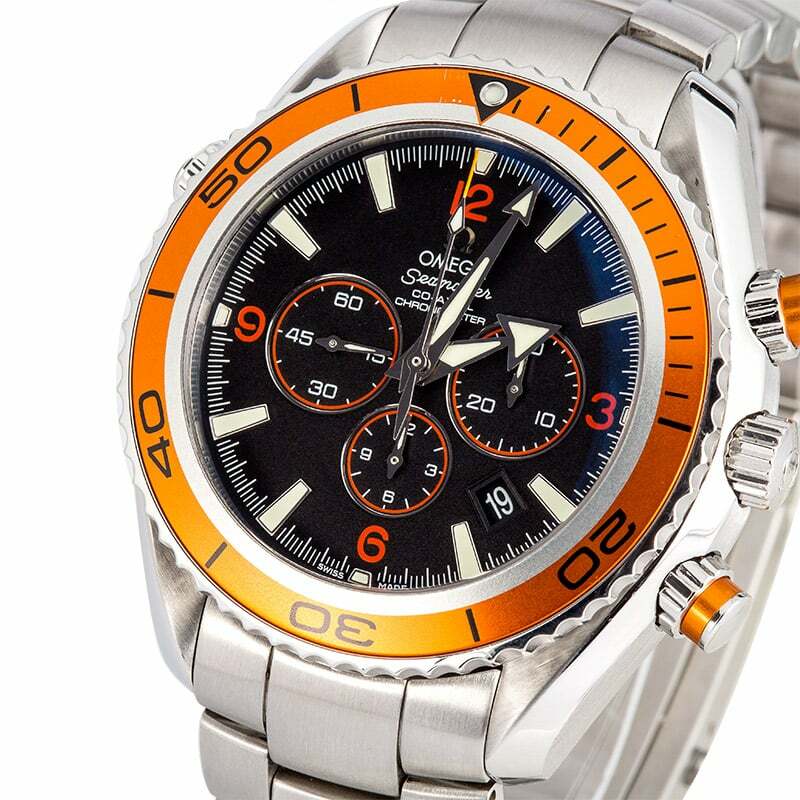 Do you like the orange color of this OMEGA Seamaster Planet Ocean Chronograph? Chime in on the comment section below.